Bella Heathcote’s long, straight, brown hair is styled in a classic ponytail hairdo..
Bella Heathcote’s long, straight, brown hair is styled in a classic ponytail hairdo. Bella wore this look to Gucci Night of the LACMA Art & Film Gala. Bella Heathcote’s pretty brown hair is styled in a classic chignon hairdo. 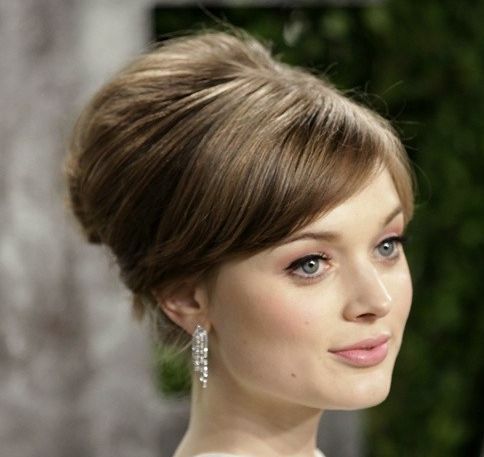 This e..
Bella Heathcote’s pretty brown hair is styled in a classic chignon hairdo. This elegant updo is perfect for any formal occasion and works well with all hair types. Bella Heathcote’s straight, brown hair is styled in a classic, bouffant updo with..
Bella Heathcote’s straight, brown hair is styled in a classic, bouffant updo with side bangs. Bella wore this hairdo to the Vanity Fair Oscar Party in 2013. Bella Heathcote’s straight, brown hair is styled in a simple updo with blunt bang..
Bella Heathcote’s straight, brown hair is styled in a simple updo with blunt bangs. Bella wore this hairdo to the premiere of Dark Shadows. Bella Heathcoat’s long brown hair falls just below her shoulders. To achieve loos..
Bella Heathcoat’s long brown hair falls just below her shoulders. To achieve loose waves, her hair was allowed to air dry. Her bangs are worn straight and cut straight across her forehead and slightly rounded on the edges to frame her face.